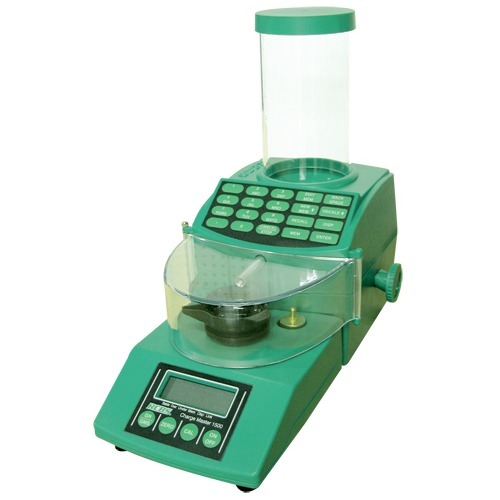 The ChargeMaster is a powder dispenser that is connected to an electronic scale. You enter the amount of powder that you would like dispensed, and it will trickle the powder onto a pan, stopping at the correct amount. I was pleased with the results I had from checking the accuracy of the RCBS scale. With the .1 grain resolution, it is as good as I could have hoped. In the last few years there has been a trend away from the traditional thrower and balance beam scales and gravitated towards electronic dispenser scales. I have a RCBS ChargeMaster 1500 that I decided to put through a few tests to see how well it was actually doing. 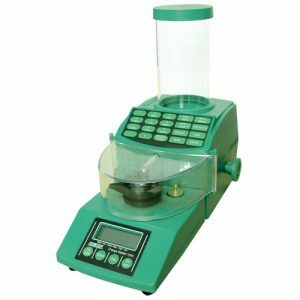 The ChargeMaster is a powder dispenser that is connected to an electronic scale. You enter the amount of powder that you would like dispensed, and it will trickle the powder onto a pan, stopping at the correct amount. You then can dump the powder into a case and dispense the next powder charge. In practice it appears to do exactly what is advertised. To use it I set up the scale and leveled it according to the instruction manual. I then plugged it in and waited overnight to do the testing. Electronic scales work best when they are left plugged in so the electronics can stay warmed up. Mine is never unplugged now. The scale comes with 2 weights to calibrate the scale. I used these to calibrate the scale and then I was ready to start testing the scale part of the ChargeMaster. In testing I used a Denver Instruments APX-203 scale as a baseline. Calibrating this with a certified check weight I started to compare weights of various items. See the below results. Here is what the weight was on the APX-203 Used as a baseline. Resolution is .02 grains. Here is the same items on the RCBS ChargeMaster 1500. Resolution is .1 grains. 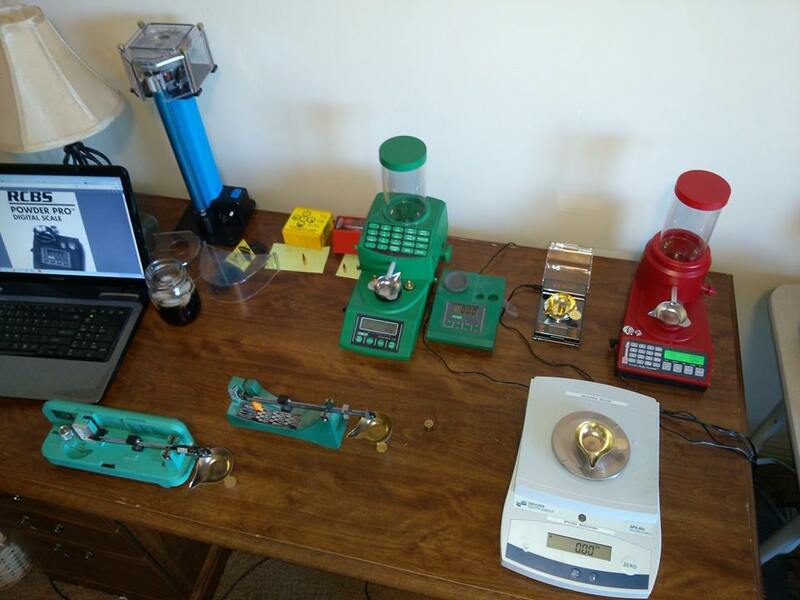 I was pleased with the results I had from checking the accuracy of the RCBS scale. With the .1 grain resolution, it is as good as I could have hoped. I then prepped the dispenser for powder. There is a drain spout on the side that you need to make sure is closed before pouring powder into the hopper (I learned the hard way). Once you have powder in the dispenser, you press dispense and the tube will begin to rotate. The course threads on the inside of the tube will pull the powder kernels to the end of the tube so they fall onto the pan. The dispenser 3 speed settings High, Low and Trickle. As it gets to the target weight it slows and eventually goes to a trickle, stopping when the correct weight. The powder is then dumped in the case and the pan is placed back on the scale. Then you can either hit dispense again, of if you hold the “Enter” button in, you will get “AUTO” to display on the screen and every time the pan is placed on the scale and it zero’s out it will begin dispensing automatically. During this test we wanted to check both how accurate it dispensed the charges, as well as how fast it was. 10 charges with the target load of 43gr were dispensed and then checked on the DI APX-203. The powders were chosen because they represented 3 different sizes of powder kernels. I was impressed with the accuracy that the scale dispenced. Its running very close to the .10gr accuracy which is typically the goal of the precision hand loader. In practice it is in line with the accuracy many get from their balance beam. It has a simple interface and held zero throughout the entire test. I validated this regularly with the check weight. The scale did not seem to be effected as much by electronics as some other scales are. I placed my cell phone next to it after the test and didn’t get any weird readings. However, it did have large zero shifts when I connected the Bluetooth next to it. The room has one heater vent that was covered during the test, and the door was closed, so we had no issues with drift from a draft. In further use after the test, I have not had any issues leaving the heater or a/c vents open during use, but they are on the other side of the room and not pointed at the scale. We did have a couple over throws that the scale indicated as such, so we dumped them back in and did not record them. What was happening was the powder was clumping together and during the trickle, occasionally a large clump would fall out at once. This issue was solved later by cutting 1.5” of a McDonalds straw “they are a slightly larger diameter and fit better” and inserting all but 1/8” into the dispensing tube. This allows the kernels of powder to line up and trickle more consistently. I also wasn’t thrilled at the speed. I was getting about the same speed it took me to throw a charge and trickle up on my electronic scale. I did some research and discovered that I could alter the programing to speed things up. After doing this I did 10 more 43gr charges with H4350. The results are below. A quick online search shows them from $289-350, but there is a manufactures rebate for $50 off if you spend over $300, so it is possible to get this for $250. We tested several other scales, so watch for those reviews.